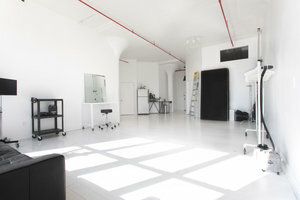 Located in Brooklyn near the Navy Yard, is this a 1300 sq ft modern white-box space that is available for photo and video productions. The airy open concept space with 15 feet high and complete with floor to ceiling windows for unobstructed views of the gorgeous Brooklyn skyline. The east facing windows allow for ample sunlight to fill the space from dusk 'til dawn. The space is easily accessed via the Brooklyn Queens Expy, it is an impressive and well-equipped studio ideal for creative projects.